Nearly two decades ago, Clayton Christiansen changed the way large companies thought about strategy and innovation with his book The Innovator’s Dilemma. Now, Larry Downes and Paul Nunes say it has all changed again. Larry Downes is a research fellow at the Accenture Institute for High Performance. 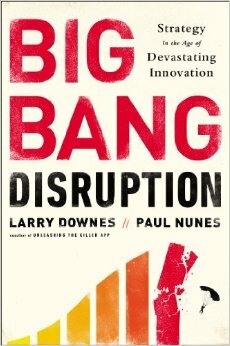 His brand-new book, co-authored with Paul Nunes, is Big Bang Disruption: Strategy in the Age of Devastating Innovation. Big Bang Disruption argues that the nature of disruptive innovation has changed, and presents twelve new rules for innovators in companies large and small to take advantage of the new opportunities of better and cheaper technologies. Together, Jesse and Larry discuss how the nature of innovation has changed, and how leaders can adjust their strategy to this new age. Article: “Big Bang Disruption: The Innovator’s Disaster” from Accenture’s Outlook magazine. Article: “Blockbuster Becomes a Casualty of Big Bang Disruption” from Harvard Business Review blog. If you like our show, please rate us on iTunes. That makes a huge difference in helping more people discover it. We love to know your thoughts about this episode. Please submit your comments below! You can also email comments to Jesse at [email protected], subscribe to him on Facebook, or follow him on Twitter.